I made this up for the Man today, and it was hit so I thought I would share it with y’all. This is a terribly quick and simple meal to make up since I fixed it while getting my bread ready to rise for the day, doing dishes and had entered the final countdown before Alex had to get ready for work. In a frying pan, over medium heat, I put the sliced pear, maple syrup, butter, garlic and half of the red pepper. 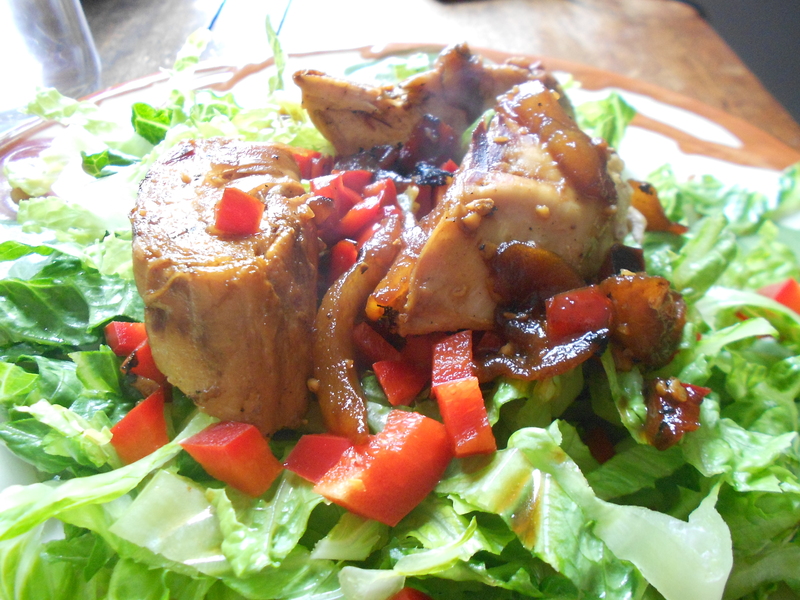 Once those things had started to simmer together, I added the chicken pieces and covered the whole bit, then let it cook ten minutes or so while I chopped the lettuce and set the table. Since stove settings very, make sure the chicken has cooked all the way through. If it starts to get a little dry, add a few tablespoons of water or broth, but if it’s covered, it should stay moist enough. Sweet, salty, mapley, garlicky – absolutely packed with flavor, we have a winner. I know this meal isn’t in the Great Chicken Challenge- but it certainly could be. 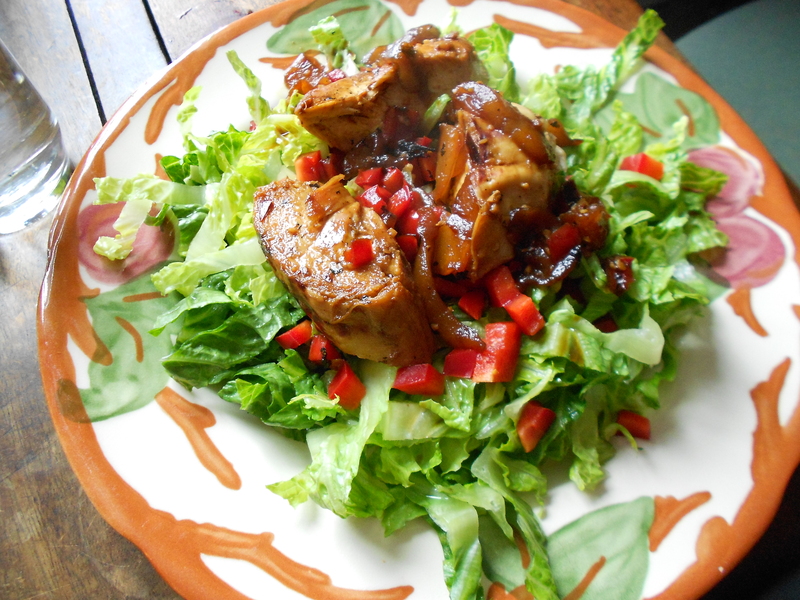 It fits all the criteria – easy, cheap, tasty and happily healthy. This would be delicious with spinach instead of romaine or iceberg lettuce, or adorned with some chopped walnuts… be creative – it’s your meal, Enjoy! Well, my threats weren’t so idle after all. I’ve been threatening to make pizza for weeks now, and last night I finally did it. I made pizza. How exciting. I love a good pizza pie, be it decorated with a garden of veggies or a simple smattering of greasy pepperoni. I like it hot and stringy *almost* as much as I like it cold and stiff the next morning. Yes, I am that “eating pizza for breakfast” person, and I’m not ashamed of it. I’ve enjoyed pizza with warm root beer and I’ve had it with a few sips of expensive red wine and I must say that it is one of those perfect foods that can hold its own in any meal-time situation. Pizza has presented itself to me in many different outfits over the years, I’ve had BBQ pulled pork pizza, loaded baked potato pizza, white pizza, red pizza (this is starting to sound like a cheesy Dr. Seuss book…) bacon and red onion pizza, pizza with tomato sauce and pizza with seasoned sour cream – and I’ve loved them all. Funny, I never thought about it until just this moment – I really love pizza! Strange coming from the person who started life as a bizarre girl who would never eat the pizza served at class parties… what was wrong with me? Thank God we grow and change… I can’t say time has erased my tendency to be a bit bizarre, but I have grown into a more normal love of all things PIZZA. Here they are, looking all good and ready to eat. I made two smallish sort of pies, one sausage and onion, the other topped with three cheeses; ricotta, parmesan and mozzarella. Baking them was quite the trick in my little oven. The recipe said to preheat the oven to 475 degrees. That’s pretty hot and I honestly wondered if there was any chance the oven would simply combust from the pressure – but it didn’t. I had to improvise a little in order to bake them since I don’t have a stone, nor a baking sheet that is ‘useable’. My little baking tray, the only one we could find that fit in the funny oven, has been systematically destroyed over the last six months. I’m not sure how or why, but it’s warped and bucked and the finish is peeling off. So, I’ve been wrapping it in foil when I need a cookie sheet, and that seems to work pretty well. 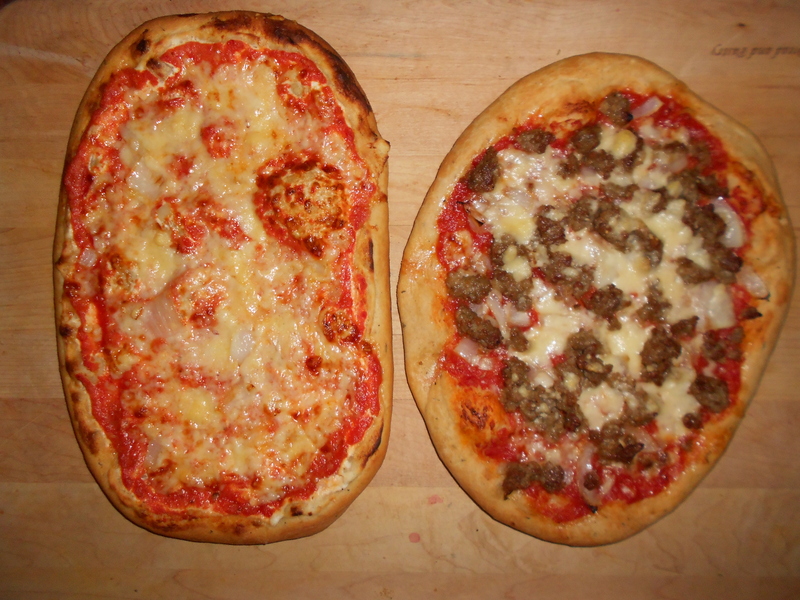 It did a more than satisfactory job baking these pizzas! I doubled the recipe and after it had been kneaded up and proofed, I split it and put half in the fridge for another day. It worked *fabulously*. I know it seems like a little thing, but it thrilled me to death to have the dough already worked up in the fridge, waiting for me to just roll it out and top it. Perfect! The yeast gets proofed in 1/4 cup of the warm water until it has dissolved and started to bubble a bit. Then, sift together the flour and salt. Now you’re going to add all the rest of the ingredients, including the proofed yeast, to the flour and start mixing. The dough is going to seem dry at first – I checked and double checked my recipe – but that’s how it is supposed to be. Dump it out on your kneading surface and start kneading. It will quickly become a smooth, rather firm dough. Now you can form it however you like and add your toppings. ** This is the fun part, I might add. The part where my husband comes wandering into the kitchen from the living room where he has been working out (oh my), admires my handiwork then grabs a hunk of the dough and proceeds to try to ‘throw’ it like a professional pizza maker. Hilarity ensues. Have you ever seen the I Love Lucy episode when she tries to make pizzas? It was kind of like that. The sky really is the limit, folks. 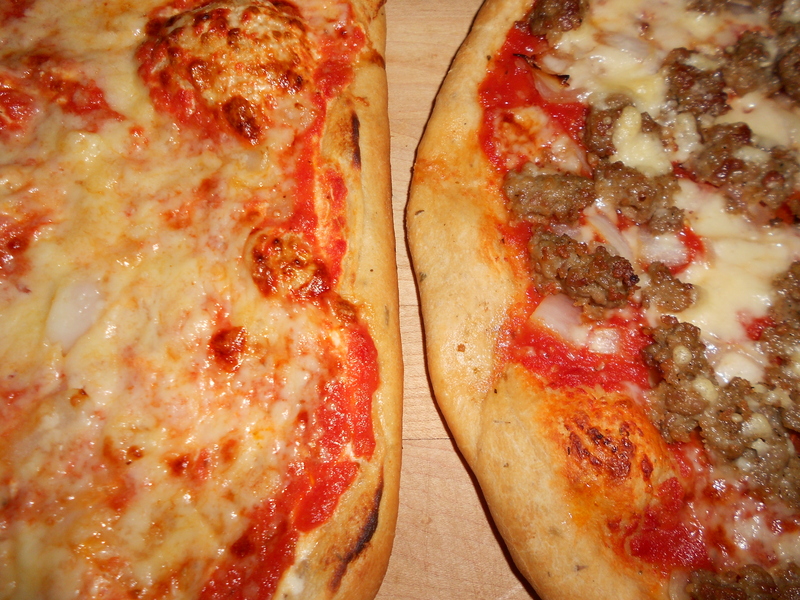 You can top your pizza with just about anything you desire – but I don’t have to tell you that! We did sausage and onions and cheese – but there’s no end to options. Any veggie under the sun would be a welcomed addition, as well as bacon, ham, pulled pork, chicken… you get the idea. I *insisted* that we buy a little ball of fresh mozzarella at the store so we could use it on our pizzas and boy was it worth it! I say that like it was wicked expensive, but it really wasn’t. It *tastes* wicked expensive! For the sauce, I simply pureed some of the chunky spaghetti sauce I had made earlier in the week. I know they sell pizza sauce in the store ready made too, and you could probable get a pretty decent tasting one. OR – *or* just use some sliced tomatoes and fresh herbs – it will sauce itself right up and be *Rustic* which is awesome. The pies bake at 475 degrees for 10-15 minutes and then they are ready to eat – YAY! It took me a while to get around to it, but Pizza has been made. 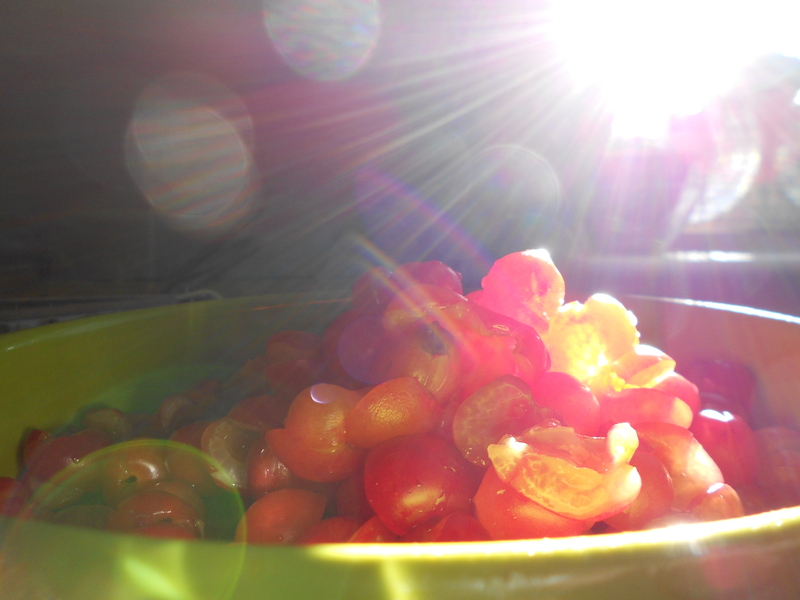 I have spent the day in intimate conversation with ripe fruit. Sounds heady. It is. The scent is intoxicating, alluring, exhilarating- everything we grasp for when making our perfumes and fail. 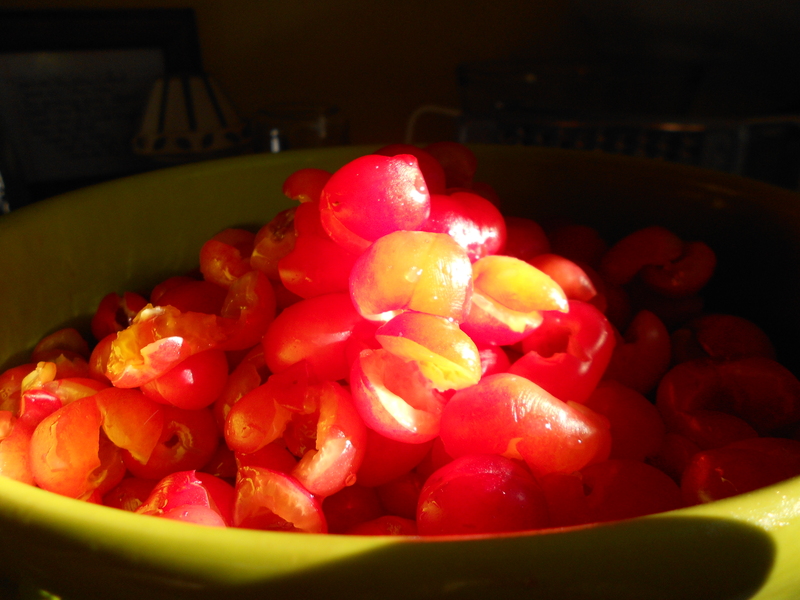 I have handled a thousand cherries, their soft little bodies rolled in my hands. 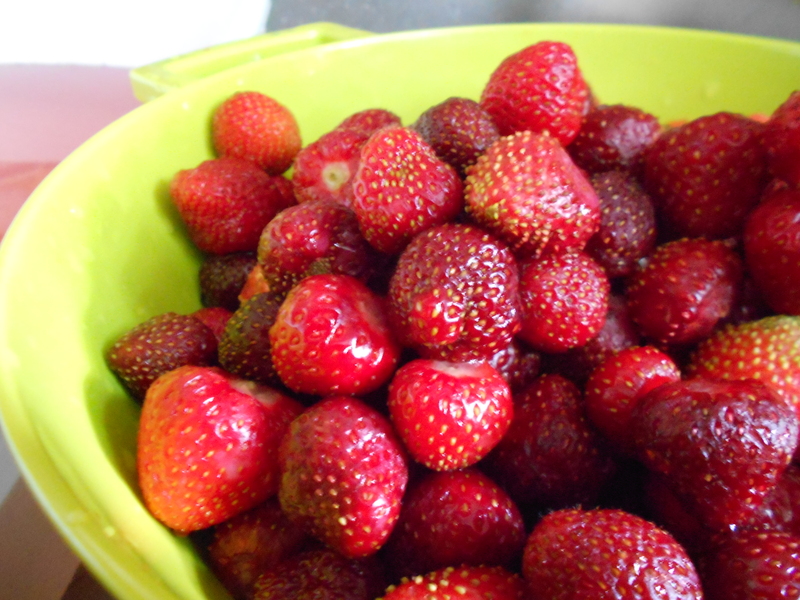 Undressed strawberries fresh from the field and tasted them, received their sweetness on my fingers and lips… I am stained. and summer is a memory. We will go on being stained and entranced by them. Is it just me – or do I hate Tuesdays? They seem a little insipid to me, they don’t carry the dread of Monday, or the relief of Friday, they aren’t in the middle or the end – they’re like an early Thursday – and everyone *knows* what Thursdays are – something we have to get through to reach Friday. What do we get when we get through Tuesday? Wednesday. So – let’s talk 10 Things. Every Tuesday, I’m going to list 10 things, random things that are totally subject to my whim and will. You are more than welcome to join me, if you so choose. 2) I love how he looks when he first wakes up and doesn’t fully realize that he isn’t sleeping anymore. 3) I love the miniature cowlick at the front of his head. 4) I love that he stopped traffic for me once while he was in uniform because no one would let me cross the road. Talk about being treated royally! He always has my back. 5) I love that when he was picking out his truck, while still a carefree buck of a boy, he made sure it had places where a car seat could buckle in, for ‘someday’. 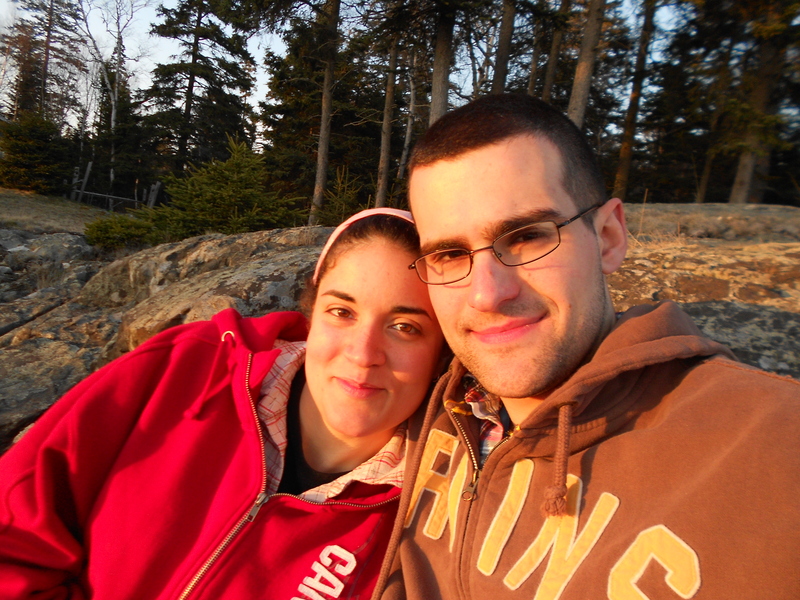 6) I love that, as uncomfortable as it makes him, he lets me cry when I need to. 7) I love that he likes to talk to me as much as I like to talk to him. 8) I love his silent “WOW”. Whenever something really impresses, shocks, delights, surprises or amuses him, he exaggeratedly mouths the word ‘wow’ – but no sound comes out. 9) I love that, even though he is a new believer, he isn’t shy to pray in front of people, or sing the hymns he doesn’t know *perfectly* – I don’t think he knows how rare and precious that it. 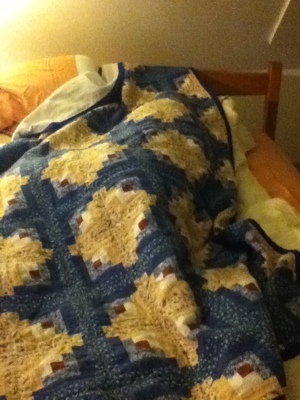 He’s *hiding* under the covers, waiting for me to brush my teeth and do all the girly before-bed things I feel I must. When I walk back into the bedroom, he’s going to pop out and *scare* me. I don’t know what I love more- the fact that he thinks he is going to scare me, or the abject horror he will experience when I pretend to have a heart attack after he does. I have good news – the woolen underwear is officially being moved to the back shelf of the closet. You know as well as I that this means Winter has finally left the Green Mountains and we have a brief but blissful run of good weather to look forward to. This isn’t the only sign of Summer to be seen; trees have greened, the roadsides are crowded with the faces of eager wildflowers and town greens and city parks are filling up with tents and stands on the weekends – Farmer’s Markets are back in session. If I were going to bring my own dressing (I think this could become a popular way to do summer parties – a BYOD salad bar…) I would definitely choose this one, Strawberry Balsamic Dressing. Not only is it exceedingly delicious, but it’s so simple to make and takes about five minutes – Tops. I call it a dressing, but it’s really more of a glaze, which means that the consistency is such that it really holds onto the greens, making every bite a Flavor Explosion. 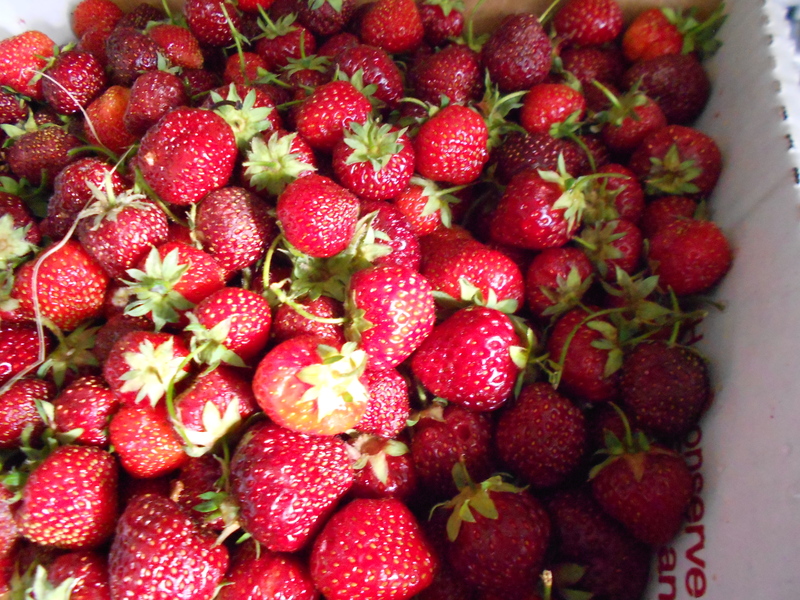 One of our local markets has recently announced that their strawberries are ripe and for the picking, and how perfect is that? 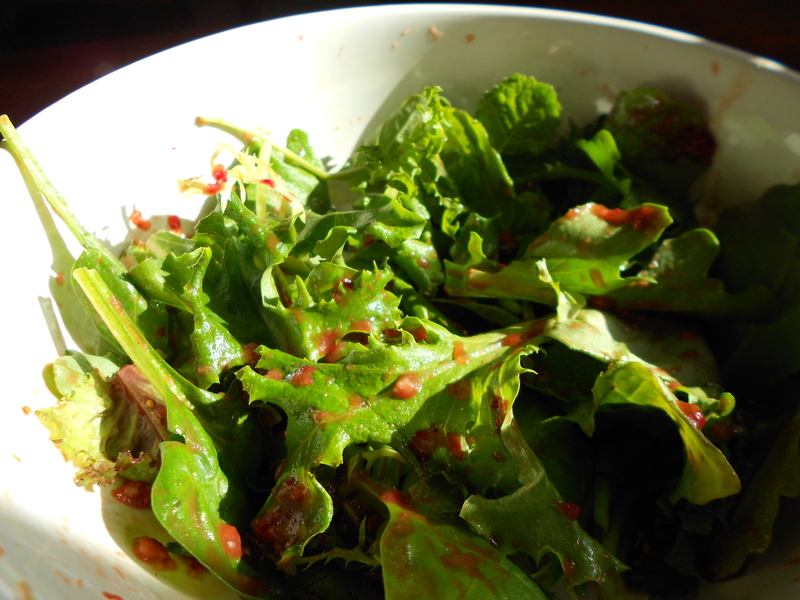 Fresh local greens with a homemade, fresh strawberry dressing -it’s a match made in Vermont Summer Food Heaven! The strawberries, balsamic vinegar and ginger mingle together into a tart, spicy, sweet sort of sauce that perfectly compliments the sturdy texture and often piquant flavor of early greens. I threw all the ingredients in the bowl of my dear little food processor and zinged away until everything was well blended and then tossed a bit of with my salad greens. Viola! I told you it would be quick! It should be the consistency of a creamy dressing, but it has the health benefits of a vinaigrette, the calorie count being less than 55 calories per serving (2-3 Tablespoons). This recipe could easily be adapted throughout the summer to showcase different fruits as they come into their season. Once the strawberries have faded, how about using farm fresh raspberries, or wild blueberries and then ripe peaches? The possibilities are nearly endless. 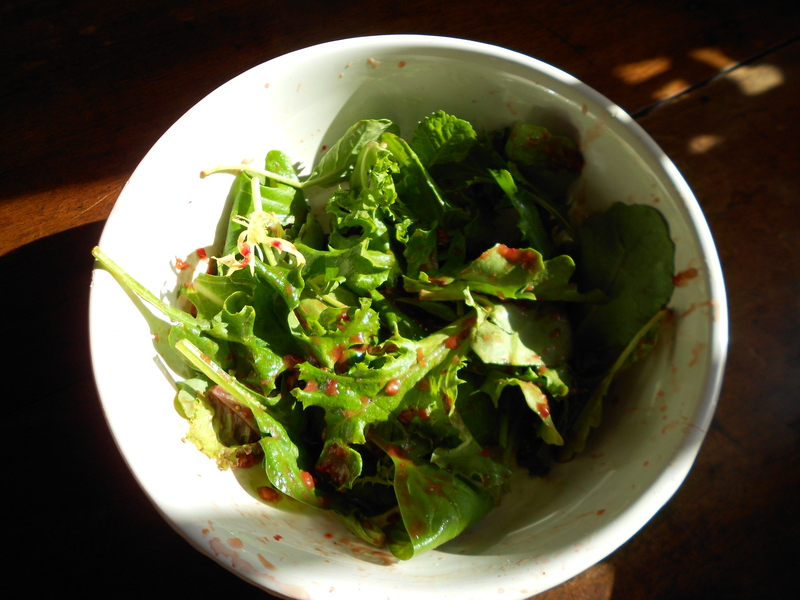 The salad mix I used included young dandelion greens, baby romaine, two types of oak-leaf lettuce, young swiss chard greens and baby spinach, but feel free to mix your own depending on what the local markets are offering. I have found that if you aren’t sure about the flavor of a certain type of green, the vendor will usually let you have a taste. They are as eager to have their customers enjoy the product as they are for them to purchase it and they love introducing people to the goodness of fresh produce. So be bold – go wander your local market and see what has sprung up with the fair skies and warmer temperatures. Just be sure to bring your dressing with you when you go! I just got home from work where I spend my time passionately straightening clothing on hangers, telling women that that skirt does *not* make them look fat and drinking copious amounts of bottled water. It’s my bottle, I refill it from the faucet in the bathroom and feel deliciously good about my recycling habit. I’ve had the same water bottle now for two weeks. My husband teases me about my love of recycling, insisting that half the things I carefully wash and sort end up in the landfill anyway because they can’t, in reality, be recycled. His father snorted along with him as they jointly taunted my obsession with saving the world, one tin can at a time. Yes, you can. They’re shiny paper, which goes in the same big metal container as the old magazines and boxboard. Yes, it is. But only those people utterly devoted to the cause of recycling would know that, thank you very much! Boxboard, shiny paper, junk mail, magazines – they all go together at The Center. My beloved new husband, who, to my abject horror, used paper towel to dry the dishes. Lots of paper towel. My childhood was spent longing for the luxury of paper towels, when we really could barely afford toilet paper. It hurt me in a deep place to see them used carelessly and then thrown away like – – – trash. Before I could pause and regain my ‘good wife’ face, I cried out in shock and pain, “What are you DOING?! ?” He was drying the dishes… he looked scared and guilty, but didn’t have a clue why. My father-in-law, the voice of uncomfortable reason. His look said it all, and we changed the subject.